That is one horrible dimples that I am looking at right now and to think that she spent such amount of money to get this done is so annoying. Well I guess she likes it. 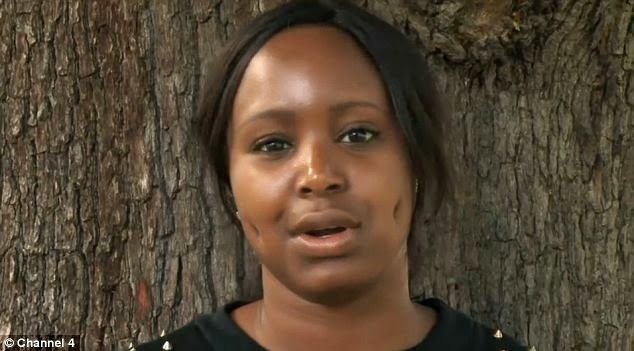 Trainee lawyer Cherelle spent £3,000 on a dimple-plasty (New treatment that creates dimples by punching holes in the cheeks). According to Cherelle, she has always admired dimples but was upset not to have any of her own. So she wanted to have one to make her look like the famous pop star Cheryl Cole. But getting her dream dimples came at a cost. Dimpleplasty surgery costs thousands of pounds and involves having holes punched into the cheeks using a scalpel. Once the hole has been created, the new dimple is stitched into place.